For other uses, see Reserve Officers' Training Corps (disambiguation). "ROTC" redirects here. For the country in Central Africa, see Republic of the Congo. For other uses, see ROTC (disambiguation). The Reserve Officers' Training Corps (ROTC) is a group of college and university-based officer training programs for training commissioned officers of the United States Armed Forces. While ROTC graduate officers serve in all branches of the U.S. military, the U.S. Marine Corps and the U.S. Coast Guard do not have their own respective ROTC programs, but graduates of Naval ROTC programs have the option to serve as officers in the Marine Corps contingent on meeting Marine Corps requirements. The Coast Guard has no ROTC program and its officers can only be commissioned via the U.S. Coast Guard Academy, Coast Guard Officer Candidate School, interservice transfer from another U.S. military service following completion of at least 4 years commissioned service in that other branch of the U.S. military (e.g. such as interservice transfers for officers designated as Army Aviators, USN and USMC Naval Aviators and USAF Pilots), or via the Coast Guard College Student Pre-Commissioning Initiative (CSPI), although the CSPI program is only available at colleges and universities designated as a Minority Serving Institute (MSI) or with a student population of at least 50% minorities for the past three years. In 2010, ROTC graduates constituted 38.5 percent of newly commissioned U.S. Army officers, 1.8 percent of newly commissioned U.S. Marine Corps officers (through NROTC), 16.7 percent of newly commissioned U.S. Navy officers and 38.1 percent of newly commissioned U.S. Air Force officers, for a combined 30 percent of all active duty officers in the Department of Defense commissioned that year. Under ROTC, a student may receive a competitive, merit-based scholarship covering all or part of college tuition, textbooks and lab fees, in return for an obligation of active military service after graduation. ROTC students attend college like other students, but also receive basic military training and officer training for their chosen branch of service through the ROTC unit at or nearby the college. The students participate in regular drills during the school year and extended training activities during the summer. Army ROTC units are organized as brigades, battalions and companies. Air Force ROTC units are detachments with the students organized into wings, groups, squadrons and flights. Army and Air Force ROTC students are referred to as cadets. Naval ROTC units are organized as battalions and also include NROTC students under "Marine Option" who will eventually be commissioned as officers in the Marine Corps. Marine NROTC students may be formed in a separate company when the program includes sufficient numbers. All Naval ROTC students are referred to as midshipmen. Some of the summer training that is offered to cadets in the Army ROTC program are: Airborne, Air Assault, Mountain Warfare, WHINSEC and other related schools. In addition to their mandatory pre-commissioning Field Training (FT) at Maxwell AFB, Alabama (4 weeks for 4-year program cadets; 6 weeks for 2-year program cadets), Air Force ROTC cadets are also eligible for Airborne training under the tutelage of the Army at Fort Benning, Georgia. Naval ROTC midshipmen will participate in summer cruise programs every summer, either afloat or ashore, similar to their U.S. Naval Academy midshipmen counterparts. The concept of ROTC in the United States was created by Alden Partridge and began with the Morrill Act of 1862 which established the land-grant colleges. Part of the federal government's requirement for these schools was that they include military tactics as part of their curriculum, forming what became known as ROTC. The college from which ROTC originated is Norwich University in Northfield, Vermont. Norwich was founded in 1819 at Norwich, Vermont as the American Literary, Scientific and Military Academy. The university was founded by former West Point instructor Captain Alden Partridge, who promoted the idea of a "citizen soldier"—a man trained to act in a military capacity when his nation required, but capable of fulfilling standard civilian functions in peacetime. This idea eventually led to the formation of Reservist and National Guard units with regimented training in place of local militia forces. Another root of the modern ROTC program comes from the "Plattsburg Idea". In 1915, Major General Leonard Wood instituted the Citizen's Military Training Corps, the first series of training camps to make officers out of civilians. For the first time in history, an attempt was made to provide a condensed course of training and commissioning competent reserve line officers after only a summer of military training. Over 5,000 men arrived at Plattsburgh in May 1917 for the first of the large training corps. By the end of 1917, over 17,000 men had been trained. By the eve of its entry into World War One, the U.S. had a prepared corps of officers including one of the earliest Plattsburgh graduates, Theodore Roosevelt Jr.
Until the 1960s, many major universities required compulsory ROTC for all of their male students. However, because of the protests that culminated in the opposition to U.S. involvement in the Vietnam War, compulsory ROTC was dropped in favor of voluntary programs. In some places ROTC was expelled from campus altogether, although it was always possible to participate in off-campus ROTC. In the 21st century, the debate often focused around the Congressional don't ask, don't tell law, signed into law by President Bill Clinton in 1993 and in force until 2011, which forbade homosexuals serving in the United States military from disclosing their sexual orientation at the risk of expulsion. Some schools believed this legal mandate would require them to waive or amend their non-discrimination policies. In recent years, concerted efforts are being made at some Ivy League universities that have previously banned ROTC (including Columbia) to return ROTC to campus. The Harvard ROTC program was reinstated effective March 4, 2011 following enactment of the Don't Ask, Don't Tell Repeal Act of 2010. Under current law, there are three types of ROTC programs administered, each with a different element. The first are the programs at the six senior military colleges, also known as military schools. These institutions grant baccalaureate degrees (at a minimum) and organize all or some of their students into a corps of cadets under some sort of military discipline. Those participating in the cadet program must attend at least 2 years of ROTC education. The second are programs at "civilian colleges". As defined under Army regulations, these are schools that grant baccalaureate or graduate degrees and are not operated on a military basis. The third category is programs at military junior colleges (MJC). These are military schools that provide junior college education (typically A.S. or A.A. degree). These schools do not grant baccalaureate degrees but they meet all other requirements of military colleges (if participating in the Early Commissioning Program) and cadets are required to meet the same military standards as other schools (if enrolled in ECP), as set by Army Cadet Command. Cadets can be commissioned as second lieutenants in the Army Reserve/Army National Guard as graduating sophomores. Upon commissioning, these lieutenants are required to complete their bachelor's degree at another institution (of the lieutenant's choosing) while serving in their units. Upon receiving their bachelors, ECP lieutenants can assess active duty and go onto active duty as a first lieutenant. Only the Army currently offers an Early Commissioning Program. In time of war, MJC's have played a significant role in producing officers for the Army. During the Vietnam war, the requirement to complete one's bachelor's degree was not in effect. Therefore upon commissioning lieutenants went straight onto active duty. One difference between civilian colleges and the senior or junior military colleges is enrollment option in ROTC. ROTC is voluntary for students attending civilian colleges and universities. However, with few exceptions (as outlined in both Army regulations and federal law) it is required of students attending the senior and junior military colleges. Another major difference between the senior military colleges and civilian colleges is that under federal law, graduates of the SMCs are guaranteed active duty assignments if requested with the approval of the school's professor of military science. The Army Reserve Officer Training Corps (AROTC) program is the largest branch of ROTC, as the Army is the largest branch of the military. There are over 20,000 ROTC cadets in 273 ROTC programs at major universities throughout the United States. These schools are categorized as Military Colleges (MC), Military Junior Colleges (MJC) and Civilian Colleges (CC). Army ROTC provides the majority of the Army's officer corps; the remainder comes from West Point, Officer Candidate School (OCS), or direct commissions. AROTC offers scholarships based on the time of enrollment in the program. Newly graduated seniors in high school can enter the program with a full four-year scholarship while college students can enroll later and earn a scholarship that would cover the remainder of their college career. The applicant must agree to accept a commission and serve in the Army on Active Duty or in a Reserve Component (U.S. Army Reserve or Army National Guard). The four-year scholarship is for students who receive it out of high school or before entering college. The four-year scholarship can be extended with the same conditions to a 5-year scholarship if the major is in Engineering. The two-and-a-half-year scholarship is available for students already enrolled in a college or university with three academic years remaining. An applicant for a two-and-a-half-year scholarship must meet the requirements for a two-year scholarship and also have a minimum SAT score of 920 or ACT score of 19. Prior to 2015, a cadet had to have passed LDAC between their summer of becoming a senior. 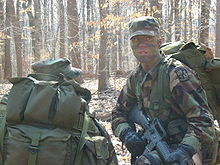 LDAC (Leadership Developmental and Assessment Course) was held at Fort Lewis, Washington until its final year at Fort Knox, Kentucky, where each cadet would be evaluated on leadership skills. The course was set up for a month of training with other peers and evaluated by prior servicemen. From 2015, cadets attend Advanced Camp between their junior and senior year at Fort Knox, Kentucky. For 2015 and 2016, the training was not evaluated and simply pass/no pass beginning in 2017 Advanced Camp will become evaluated again. Cadet Summer Training (CST), including Advanced Camp and basic camp, is the U.S. Army's largest training event. The Naval Reserve Officer Training Corps (NROTC) program was founded in 1926 and the U.S. Marine Corps joined the program in 1932. The naval NROTC program is offered at over 150 colleges nationwide. The Nation's first Marine Corps oriented NROTC was established at The Citadel in 1970. The first Air Force Reserve Officer Training Corps (then Air ROTC) units were established between 1920 and 1923 at the University of California, Berkeley, the Georgia Institute of Technology, the University of Illinois, the University of Washington, the Massachusetts Institute of Technology and Texas A&M University. After World War II, the Air Force established ROTC units at 77 colleges and universities throughout the United States. The military may be more comfortable when it retreats to parts of the country ... where universities don't ask a lot of questions .... [C]olleges may also be more comfortable when they go along with the fiction of banning ROTC, because then they don't have to answer to people upset about "don't ask, don't tell." Everyone buys into the myth, but at the expense of military readiness. The military needs to return to the colleges it walked away from, and everyone needs to stop pretending that ROTC programs ended because of a ban. Others argue that universities effectively ban ROTC by erecting procedural hurdles motivated by anti-military sentiment and objections to discrimination based on sexual orientation that only serve to "discourage their own presumably egalitarian, intelligent, and enlightened students from joining". ROTC programs were subject to the military's ban on service by open gays and lesbians known as "Don't ask don't tell". LGBT students occasionally protested ROTC as a proxy for the policy. An act to repeal the policy was signed by President Barack Obama on December 22, 2010 and implementation took effect September 20, 2011. Other national armed forces in countries with strong historical ties to the United States have ROTC programs. ROTP in Canada is a named academic training program for officer entry into the Canadian Armed Forces. Where educational requirements for specific programs are not available at Royal Military College, cadets may attend courses on suitable colleges or universities anywhere in Canada. There is little formal military training during the academic year. However, they are subject to educational institution-specific military law and regulations. Officers' Training Corps for the British Army was set up in 1908. The University Air Squadron for the Royal Air Force and the University Royal Navy Unit for the Royal Navy are similar. Although all members are commissioned as under officers in their respective services, they are employed on a territorial class B commission and there is no obligation to serve as a regular officer. ROTC in the Philippines began in 1912 during American colonial rule with the creation of the first unit at the University of the Philippines. The National ROTC Alumni Association (NRAA) of the Philippines estimates that 75 percent of the officer corps of the Armed Forces of the Philippines come from ROTC. ROTC in South Korea started in 1961. ROTC in Taiwan started in the 1960s with training courses being severely reduced over the years as an experiment before it was implemented again in 1997. Other countries have also institutionalized reservist training programs. Reserve Officer Training in Russia began in the 1920s, Brazil has the CPOR and the NPOR since 1928, difference being that the officer formed by the CPOR choose their area while specialization while the officer formed by the NPOR learn from their local army base. During World War I, the United States created the Student Army Training Corps in an effort to encourage young men to receive both a college education and train for the military simultaneously. Those young men who did exceptionally well in the SATC classes were recommended for classes in the ROTC. On February 10, 1918, the War Department created the Committee on Education and Special Training. The purpose of this committee was to assess the needs of the military branches and attend to said needs. Seeing a drastic need for trained soldiers, the Student Army Training Corps was created to provide "special training for men entering the service through voluntary induction". Training camps were held in the summer of 1918 to prepare institutions with at least one-hundred male students for the induction of the SATC that fall. Training started July 18 and lasted for sixty days. The SATC officially began on October 1, 1918. It was located on 525 educational institutions and inducted 200,000 total students on the first day. Unlike the Selective Service Draft, enrollment in the SATC was completely voluntary. However, doing so gave you the rank of private in the United States army, therefore this was not a way of avoiding enlistment. While attending the SATC did allow for young men to stay on the home front, the ultimate goal of this was creating trained soldiers for the military. ^ "Directives Division" (PDF). www.DTIC.mil. Archived (PDF) from the original on 30 December 2016. Retrieved 4 October 2017. ^ "Naval Reserve Officers Training Corps - Marine Corps". www.nrotc.navy.mil. Archived from the original on 7 November 2017. Retrieved 8 May 2018. ^ "Does the Coast Guard offer an ROTC program at colleges?". www.gocoastguard.com. Archived from the original on 5 December 2017. Retrieved 8 May 2018. ^ "College Student Pre-Commissioning Initiative (Scholarship Program)". www.gocoastguard.com. Archived from the original on 19 March 2018. Retrieved 8 May 2018. ^ "U.S. Coast Guard College Student Pre-commissioning Initiative". Gocoastguard.com. Archived from the original on 2012-05-04. Retrieved 2012-04-28. ^ "Population Representation 2010 - Active Component Commissioned Officer Gains". Defense.gov. Archived from the original on 26 June 2012. Retrieved 4 October 2017. ^ Lord, Gary (1995). "Images of Its Past". Norwich University. Harmony House. ISBN 9781564690234. Archived from the original on 2010-11-03. Retrieved 2012-12-27. ^ Holden, COL. Russell J. (2013). Norwich University Cadet Handbook. Northfield, VT: Office of the Commandant, Norwich University. pp. ii. ^ "The Fight Against Compulsory ROTC". Free Speech Movement Archives. Free Speech Movement Archives. 2006. Archived from the original on 2006-12-17. Retrieved 2006-11-20. ^ Mazur, Diane H. (2010-10-24). "The Myth of the ROTC Ban". The New York Times. Archived from the original on 2017-07-01. ^ "Advocates for ROTC". Advocates for ROTC. advocatesforrotc.org. 2006. Archived from the original on 2007-02-01. Retrieved 2006-11-23. ^ "AR 145-1 (Reserve Officer Training Corps)" (PDF). Army Regulation. United States Army. 1996. Retrieved 2006-11-16. ^ "10 USC 2111a". United States Code. Legal Information Institute. Retrieved 2006-11-16. ^ "Army Regulation 145–1 Senior Reserve Officers' Training Corps Program: Organization, Administration, and Training" (PDF). U.S. Army. U.S. Army. p. 6. Archived from the original (PDF) on 2017-08-01. Retrieved 2017-08-01. ^ "U.S. Code Title 32 CFR 110.4 - Responsibilities". U.S. Federal Government. Cornell University Law School. Archived from the original on 2017-08-01. Retrieved 2017-08-01. ^ "Error - U.S. Army Cadet Command". www.CadetCommand.Army.mil. Archived from the original on 28 May 2014. Retrieved 4 October 2017. ^ "Citadel "Double Dogs"" (PDF). www.citadelsantonio.org. Marine Corps Association. Archived from the original (PDF) on 2015-08-12. Retrieved 2015-11-13. ^ Mazur, Diane H. (2010-10-24). "The Myth of the ROTC Ban". The New York Times. Archived from the original on 2016-12-20. ^ "GMA's Speech - National ROTC Alumni Assoc". ops.gov.ph. Archived from the original on 27 September 2006. Retrieved 4 October 2017. ^ Lee, Jisoo. "Blue Suits and Blue Berets?". Archived from the original on 21 February 2014. Retrieved 24 July 2013. ^ Sang-ho, Song (1 July 2011). "Korea, U.S. ROTC cadets cement alliance". The Korea Herald. Archived from the original on 5 January 2013. Retrieved 24 July 2008. ^ "ROTC courses won't be reduced at NTU". The China Post. 2009-04-21. Archived from the original on 2015-04-03. Retrieved 2012-09-10. ^ Brian Hsu. "First ROTC officers to go into service by month's end". Taipei Times. Archived from the original on 2014-04-20. Retrieved 2012-09-10. ^ "CPOR e NPOR - Serviço Militar - Exército Brasileiro". www.EB.mil.br. Archived from the original on 5 October 2017. Retrieved 4 October 2017. ^ Jenison, Marguerite (1923). Illinois in the World War Vol V: The Wartime Organization of Illinois. Springfield, Illinois: Illinois State Historical Library. pp. 112–113. Deborah D. Avant (2005) The Market for Force: The Consequences of Privatizing Security, Cambridge University Press. David Axe (2007) Army 101: Inside ROTC in a Time of War. Charles Johnson (2002) African Americans and ROTC: Military, Naval, and Aeroscience Programs at Historically Black Colleges 1916 — 1973. Betty J. Morden (1990) Women's Army Corps, p 287. Jennifer M. Silva, "ROTC", chapter 35 of Gender and Higher Education by Barbara J. Bank. Harlow G Unger (2007) Encyclopedia of American Education, p 938. David Atkinson (2012) Ultimate ROTC Guidebook, The: Tips, Tricks, and Tactics for Excelling in Reserve Officers' Training Corps. Wikimedia Commons has media related to Reserve Officers' Training Corps (ROTC).